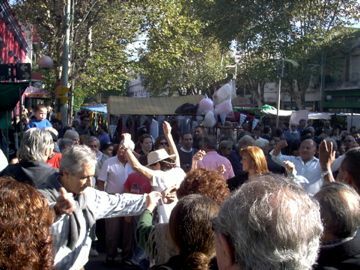 One of the best-kept secrets in Buenos Aires is the Feria de Mataderos, a weekly event that takes place during the fall, winter and spring months (approximately March to December) on Sundays, from about 11am and into the early evening (during January to the start of March a cut-down version of the Mataderos fair is SOMETIMES held on Saturday nights, from 6pm – but we would advise searching online at the time before trying to attend that). You may already know about the ferias (street fairs) in San Telmo or Recoleta, but if you want a real South American experience, come to Mataderos to see the gauchos (Argentine cowboys) and friends, who come from the countryside with their displays of horsemanship, handicrafts, live music, folk dancing, and delicious foods. The fair has an upbeat and jovial atmosphere, despite taking place in one of the poorest sectors of the capital. Mataderos, and its neighboring neighborhood of Liniers, were where cattle were traditionally brought in from around the country, slaughtered, and then shipped out as meat to other parts of the capital (in Spanish, Mataderos literally means slaughterhouses – and the area is also often called Nueva Chicago, because of the cattle-killing heritage it shares with the ‘Windy City’). For this reason there is an interesting mix of cultures: gauchos, porteños, and migrant workers from Bolivia & Paraguay. The fair represents this colorful combination of traditions, dancing and artwork. To get to the fair from other parts of Buenos Aires is about a 45-minute-plus bus ride on one of the following colectivos (city buses): 55, 63, 80, 92, 117, 126, 141, 155, and 180. Of these, the 55 and the 92 are the ones that bring you closest; with the others you may have to walk a little bit. Just ask the bus driver to let you off at the fair (if you are following your map, with the 55 and 92 buses, the exact intersection you need to get off at is Av. Directorio and Av. Lisandro de la Torre). Mataderos can sometimes be a bit of a rough neighborhood, so be sensible and keep an eye on your belongings – leave the Rolexes, pearl earrings, and mega-expensive cameras at home. Of course it’s fine to bring a camera and some money, but always be aware of where they are on you, and don’t flash either around carelessly (this is of course also good advice for all tourists visiting any city in the world) – especially as the fair is usually very crowded. At the Mataderos fair, you can spend a few hours taking in the gaucho culture by watching the locals do folk dances known as zambas, accompanied by live musicians on a nearby outdoor stage. The zamba (not to be confused with the extremely different Brazilian samba) is a pleasure to watch. It is danced in pairs, a staged routine of flirtation in which the man and the woman dance toward each other and then quickly whirl away, waving scarves or handkerchiefs in flirtatious gestures. The dancers wear traditional Argentine costumes from the countryside, often in bright colors. My favorite part is when the men break into rhythmic step dances, which is akin to tap dancing with gaucho boots: very impressive! With the live band playing folk music on accordions, traditional bombo legüero drums, folk guitars, and vocals, it’s a true fiesta, a street party, and people might grab you by the shoulder and laughingly try to pull you into their dancing circle. Feel free to join in! There are plenty of beautiful handicrafts at the fair, and in fact you might find some of the best deals in Buenos Aires here. 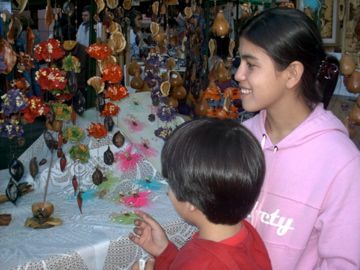 Specialties of the Mataderos fair are leather goods, mate gourds, stone and silver jewelry, trinkets and good-luck charms molded from clay or other natural materials, key chains, wind chimes, and other fun objects that make great souvenirs or gifts. Usually the price the seller gives you is what you are expected to pay, although if your Spanish is good and you are accustomed to bargaining, you can try to get a deal for buying more than one thing. For example, if you buy five necklaces, the seller may give you five or ten percent off the price. If you are on the lookout for a souvenir that is purely Argentine, keep your eyes open for something known as a duendito. These are little clay figures that look like miniature garden gnomes, and you can always find them in any Argentine craft fair. The figure is supposed to radiate the spirit of the mountains and nature, and it is often wearing a big floppy hat and something like elf shoes. Some artisans make them with plaques where your name or a message like “Luck of the duendito” can be engraved to personalize your gift. As you walk around the Feria de Mataderos, which covers four long blocks in the streets, you may want to grab a choripan or a pancho. 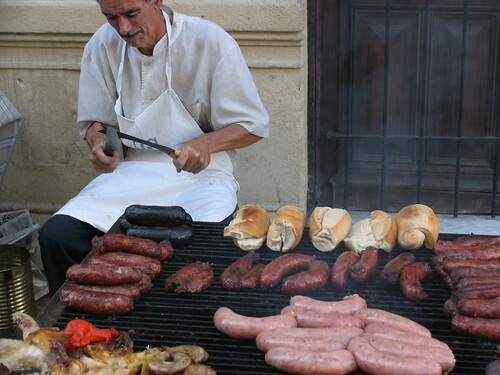 These staples of Argentine street cuisine are grilled sausage sandwiches and hot-dogs, respectively. The greasy treats are obscenely cheap and also not the healthiest choices, but there’s nothing quite like munching on a choripan while sitting on a bench people-watching on a Sunday afternoon. 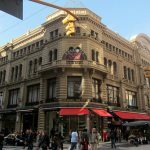 If outdoor food, or greasy sausages for that matter, aren’t your style, then take a look at this Argentina Travel Guide blog, which has a review of an interesting place to eat in Mataderos – that is, if you like the choices on offer of empanadas, empanadas, or… empanadas! However, if you like variety and trying something new, there are many other cheap restaurants and stalls, most with outside seating, lining the fair, offering up delicious Argentine regional treats such as locro, asado, tamales, and torta frita. For many people, the most interesting event at the Feria de Mataderos is the Carerra de Sortija – the “Race of the Ring”. This usually starts at about 3.30pm along a stretch of the road Av. Lisandro de la Torre, and it is where gauchos race their horses at breakneck speeds towards a small ring hung onto a raised metal frame overhead. The gauchos stand up in their stirrups as they race, and try to spear the ring, which is no larger than a normal piece of jewelry, with a small pointy stick. Everytime a gaucho is successful in spearing the ring, the crowds go wild, and the gaucho is extremely happy to milk the applause for all it’s worth as he trots back on their horse through the crowd holding the ring above his head. If it rains, the Mataderos usually still goes ahead. However, on holidays, such as election days, the fair is not held. You can find up to date information at the official Feria de Mataderos website. You can also call to ask questions: 4687-5602 (on Sundays) or 4374-9664 (Monday through Friday), but of course your Spanish will need to be pretty decent for that. So grab your camera, friends, hostel-mates, significant others, children, or parents, and head out to the Feria de Mataderos to experience provincial Argentine culture and relaxation; this is an activity for everyone, of any age and personality. Enjoy the colorful music and dance, try some of the foods, take some great photos, marvel at the gaucho horsemanship, and don’t forget to get a souvenir to take home as a memory. Galerías Pacífico Shopping Mall Constructed in the 1890's as an elegant home to a Parisian department store, the Galerías Pacífico in Buenos Aires is a grand shopping mall whose history is entwined with that of the city itself. San Telmo Sunday Fair / Feria The Feria de San Telmo is one of the most notable events in Buenos Aires. Nestled in one of the city's oldest neighborhoods, the San Telmo Fair is bustling with unique artisans and antiques every Sunday. 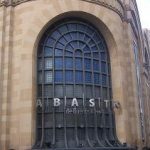 Abasto Shopping Mall Opened originally as the city's central market, this beautiful Art Deco structure now functions as one of Buenos Aires' liveliest shopping centers. Also a great choice for a weeknight movie or a family outing. Your post captures the fun and flavor of a real Argentinian fair. And thanks so much for the shout out regarding Ruben and my guided tours there (with folklore and tango participation, if desired). Best of luck with your Mataderos guided tours, and if any of my readers take your tour after seeing it mentioned here, ask them to come back and say how the day at the Feria was, in the comments section here! 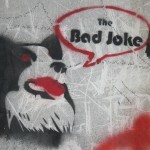 Reading your blog is like seeing Buenos Aires! I am learning much about your marvelous city and Argentina. Okay, the dog riding the horse was the clincher. I have to go back. I went once and I didn´t see that. Also, one word of advice. The grilled food on the street looks great and smells even better, however meat and a broken cold supply chain is not the best combination. Feel like playing Russian roulette anyone? Thanks for the nice comments – are you planning on visiting Buenos Aires any time soon? The last time someone mentioned the cold chain to me was when I worked in a supermarket over 5 years ago… but you have a good point. Although, I think many restaurants are just as risky as street stalls. I still think I’ll keep playing this game of Russian Roulette… I need this kind of “spice” in my life (you already have yours). So the regular fair is not held on Sundays during January and February. Instead, they have a smaller version of the fair on Saturday nights during these two months, from 6pm, which they now appear to be calling “Kermesse” (as you mention). We do not offer tours to the Feria de Mataderos, but if you or anyone else is interested, we know someone who offers food tours to the fair.